Mr.Coffee espresso/cappuccino coffee machines of Café Barista Series are considered to be as one of the most popular and handful kitchen appliance. These coffee machines are widely used all over the USA and Canada both at coffeehouses and at home. Mr. Coffee Café Barista coffee machines are handy and useful. They have a wide range of functional features and can brew really nice espresso and milk beverages (see more here). But problems sometimes can occur. The system stops working or brewing. And sometimes it’s rather hard to find out the reason. 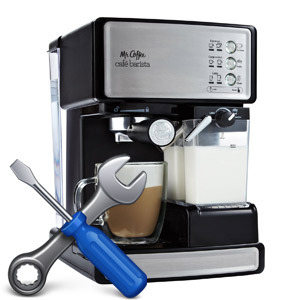 So, let’s watch over the problems that may occur with your Mr.Coffee Coffee machine, and find out how to solve them. If you can not imagine your everyday life without a cup of coffee, and you hate the sameness in your kitchen than Delonghi BCO 330T is what you need. It is the unique system that will allow you to combine tastes and brew different types of the perfect beverage every moment you want it. With such an animal in your kitchen, you can enjoy with regular coffee each morning, every minute you’ll choose to brew it for you. But that’s not all. With BCO 330t you will also enjoy with espresso, latte, cappuccino ― everything you like is in one perfect device.